Achilles tendonitis is caused by a problem called Achilles tendinopathy - microtears in the Achilles tendon. These microtears cause the pain that you feel with walking and running. While these tears can take weeks to months to heal, wearing a night splint for Achilles tendonitis can help. These splints can make sleeping at night less tender and help make your first step getting out of bed in the morning less painful. Getting the Achilles tendonitis right splint is important to properly address the location of your injury. Not all splints labeled as “new”, especially those on Amazon, provide the same results. If your problem is in the tendon itself then standard night splints for Achilles tendonitis will be appropriate. But if your injury is located down by your heel where the tendon attaches to the back of your foot then an adjustable dorsal night splint for insertional Achilles tendonitis will provide greater adjustability to help treat your injury more effectively. WHAT'S THE BEST NIGHT SPLINT FOR ACHILLES TENDONITIS? 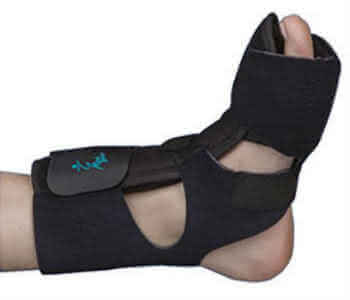 The Thuasne NOX Splint is designed for Achilles tendonitis sufferers. The splint has one of the easiest designs for ease of use compared to other high-end splints. The NOX (Greek word for "Night") has an adjustable strap in the front that you pull to increase the amount of stretch on your Achilles tendon. Our staff likes the indicator window in the front that shows the degree of stretch being applied to the tendon. 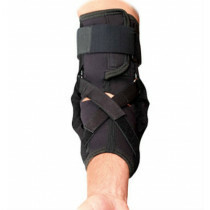 The majority of reviews report the tendonitis splint does a good job relieving acute, as well as, long term pain. The material is breathable and the low-profile design allows for maximum airflow so you can sleep comfortably at night. The gripping strips on the bottom are a nice addition too. They provide a mild gripping surface that makes standing up at bedside and limited walking a safe undertaking. 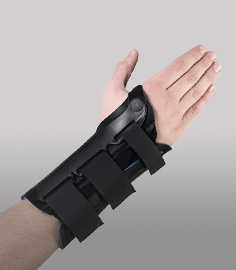 Our staff gives the NOX Splint a 97 Score based on customers' reviews. Lightweight, Low-profile design. Can feel uncomfortable and pull forward off the ankle during a maximum stretch. Well padded throughout for comfort. Adjustable for more or less stretch. Non-skid tread on the sole for safety. The MedSpec Phantom Dorsal Night Splint features a bendable aluminum insert that holds the foot in the desired position of stretch. 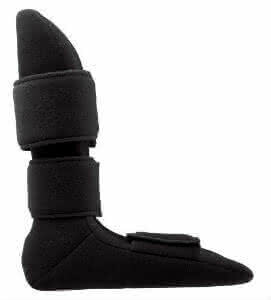 The neoprene straps hold the ankle close to the splint to ensure a consistent stretch is being applied during the night. The velcro straps are easy to apply and fit every size foot. The splint is well padded very well on the inside for maximum comfort. Best of all it's made in the United States for higher quality control standards. For daily use, this Achilles night splint is hard to beat. Reviewer's Score: 95.6. Highly padded inside for comfort. Made in the USA for durability. The Breg Soft Night Splint is doubled up with extra padding throughout the splint to eliminate any irritation or hard edges while you are sleeping. The padding is perfect for all-night support. There are three adjustable velcro straps that can be adjusted for comfort. They maintain your foot position deep inside to maintain a neutral angle for proper healing. It does not contain any natural latex for those that may be allergic. 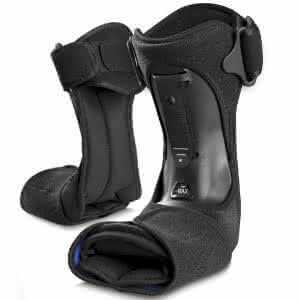 The open front enables the splint to fit a wider variety and sizes of feet. 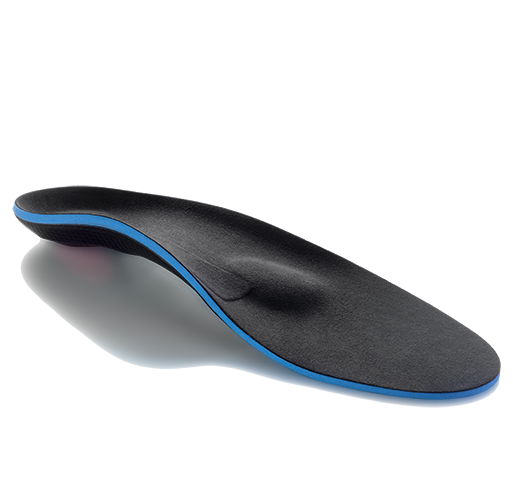 Best for chronic injuries that require the foot to be held in a 90-degree angle to reduce pain. Sizing for this item is true to the sizing information and people with wide feet and/or larger calves than most will find this to be well designed and able to fit their body shape properly. 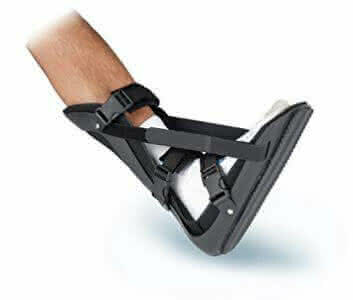 The brace can be worn on either foot which boosts its versatility and convenience. This adds value to its price making it worth every penny. Reviewer's Score: 92.3. Heavily padded for all-night support. Some wearers had issues with the static, non-adjustable design. Open front design fits a wide variety of foot and calf shapes. Fits right or left foot for convenience. Durable design for heavy daily use. The Ovation Medical Posterior Night Splint has an open front design that makes it easier to fit people with different size calves and feet. It has adjustable padding inside that helps keep you foot always positioned properly instead of sliding around which happens with some other lesser quality brands. The straps click into place with the three snap buckles on the side so patients don't have to re-adjust them during the night. The three buckle straps are latex-free and are well padded for comfort to help you get a good night sleep. The adjustable straps on the sides are used to create more stretch by bringing the foot upwards closer to the front of the leg. The hard exterior design with the heavy padded liner provides great support and comfort. It's affordably priced for most people. Reviewer's Score: 85.2. The splint is latex-free for people with sensitivities The product has a slightly bulky design. No need to re-adjust the straps at night with the snap buckles. Adjustable side straps provide more or less stretch. Fits both feet and different leg and foot sizes easily.